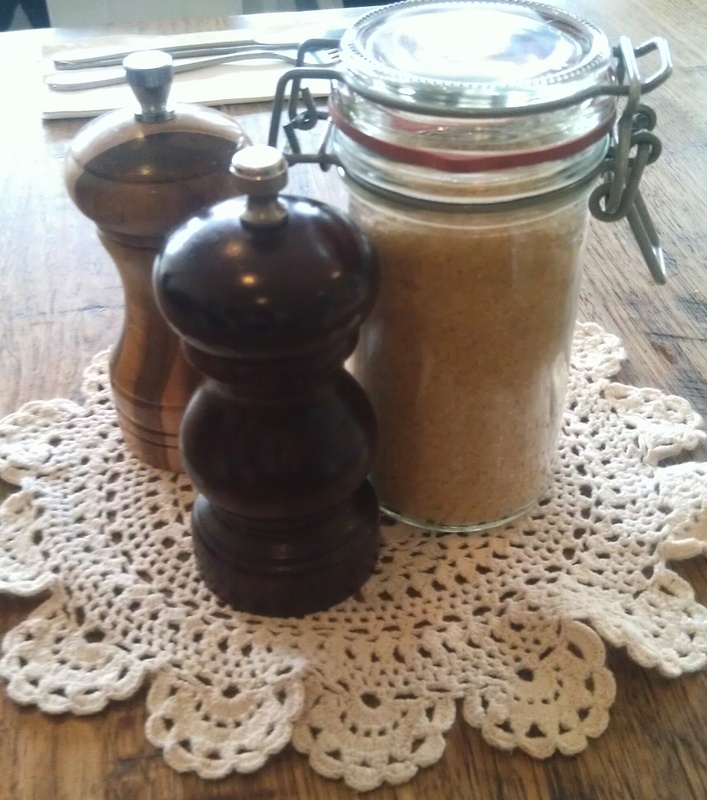 I do think a crocheted doily on a lovely hardwood timber table is a good omen for a cafe. Mixed Business is on Queens Parade, right at the end of Hoddle Street on the border of North Fitzroy, Clifton Hill and Northcote. It is a place I pass all the time, but I am often driving and it is a bit awkward to park near – you sort of have to deliberately go there. And last Saturday I did, after going to an auction on McKean Street around the corner. Elise and I popped in for a coffee and quick lunch. It was packed inside and out the front, and pretty busy out the back too – we got the last inside table which was excellent as you may recall it was a pretty chilly day. In terms of food this cafe offers nice daytime stuff. They have all-day breakfast options (which I would have had if Clive hadn’t already cooked poached eggs for breakfast), lunch includes interesting sandwiches and rolls and there are also a couple of specials for the winter months including a soup. Elise and I both had rolls – mine with crumbed chicken and spicy coleslaw and Elise had the meatballs. They were great! And I loved the decor. Lots of lovely recycled stuff . I really liked the lightbox on the wall. I can’s say I have noticed one like this anywhere else before (I’ll probably see them all the time now, or maybe not …). Anyway, it looked super. 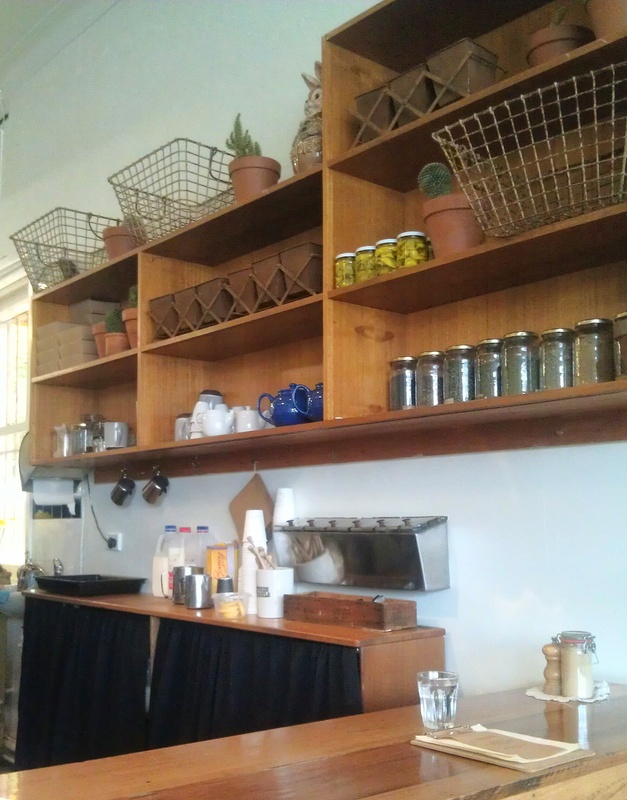 And there were recycled timber shelves and benches in the service area, with wire baskets and jars and tins etc. as decoration. And I noticed a little wooden box on the bench underneath that is a bit like the velveeta wooden box I picked up the other week. I wonder what they use it for? And look at those metal canisters mounted on the wall. I’d love some of those at home … I am already dreaming of how sorted and organised my life could be with something like that in my kitchen! 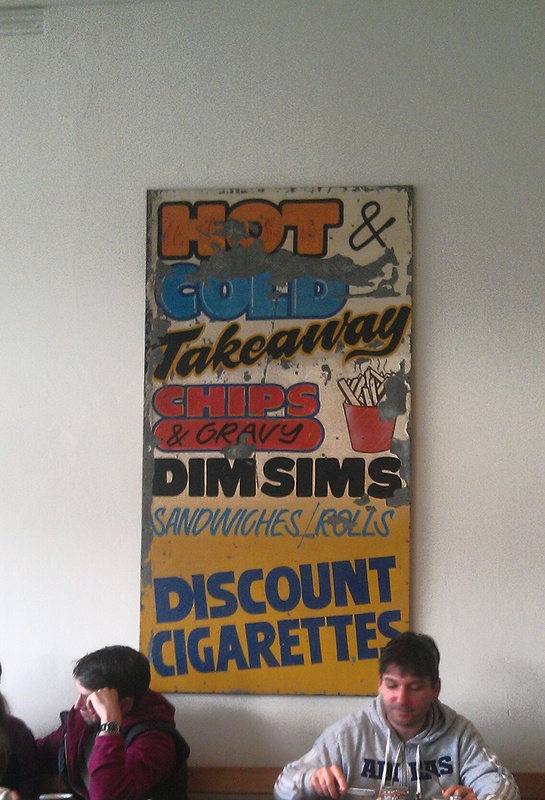 There is a fun vintage sign that dominates the dining area. Outside there is a cheery wheelbarrow of geraniums to brighten up any trip to the toilet and they have a super set of recycled industrial green chairs for outdoor dining with terracotta pots and more geraniums as decoration. And a pile of crocheted blankets (I forgot to take a photo) – I guess they are for if you get chilly when you are sitting outside. How lovely! 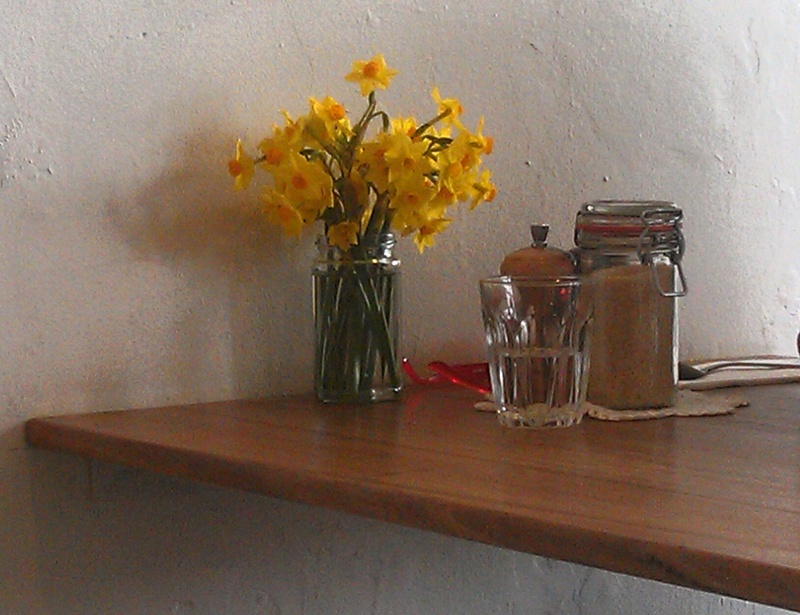 And some cheery fresh flowers in little jars on some of the tables – maybe they come from the florist next door? And the food came quickly. 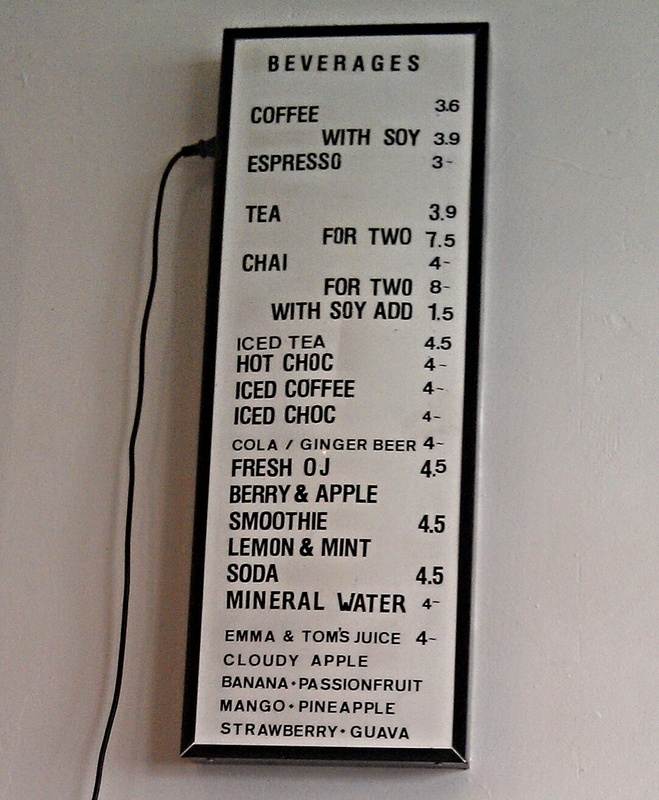 Mixed business is fun, interesting, thoughtful, considerate and friendly. What more could you want from a lunchtime cafe?